It’s funny the way things turn out. Just earlier this week, I’d been talking to someone about the first few months of my inaugural groundhopping season. During this conversation I happened to mention that about the only thing I’d yet to see so far this season was a team get a real tonking. I’d seen a goalless draw; several high-scoring thrillers; score draws; comeback victories; an unsuccessful comeback; penalty shoot-out drama; last minute winners; red cards aplenty… you name it, I’d seen it. Yet aside from a few 4-0 scorelines, which in my book counts as a comprehensive victory/defeat (depending on which side of the score you’re on) rather than a total thrashing, a trouncing had so far eluded me. Little would I know that just a few days later, this would change. 9-0 is an absolute hiding in anyone’s book. Not that I’d set out to intentionally find a game likely to deliver such a one-sided victory. Although I can accept that it may have looked like I had. Prior to Saturday, St Francis Rangers were bottom of the league with a woeful goal difference of -31 from just 13 games. Hailsham Town on the other hand, had made a steady if not spectacular start to the season, and while they may have only been eighth in the league going into the game, they had the fifth best goal difference in the league at +11. A perfect combination for a high-scoring victory. In fact, my choice of what game to attend was dictated mostly by circumstance. With my wife at a friends’ 40th Birthday do, I was only too willing to accept a long-standing invitation from my Mum to have dinner at her house one Saturday evening. After all, it meant I wouldn’t have to worry about cooking for myself and my two boys when I got home from the football. Result. 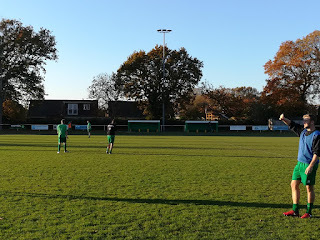 Not wanting to turn up to her house too late, a quick check of the fixtures revealed a trip to Hailsham would be the sensible choice, taking into account games at grounds I’d already been to. 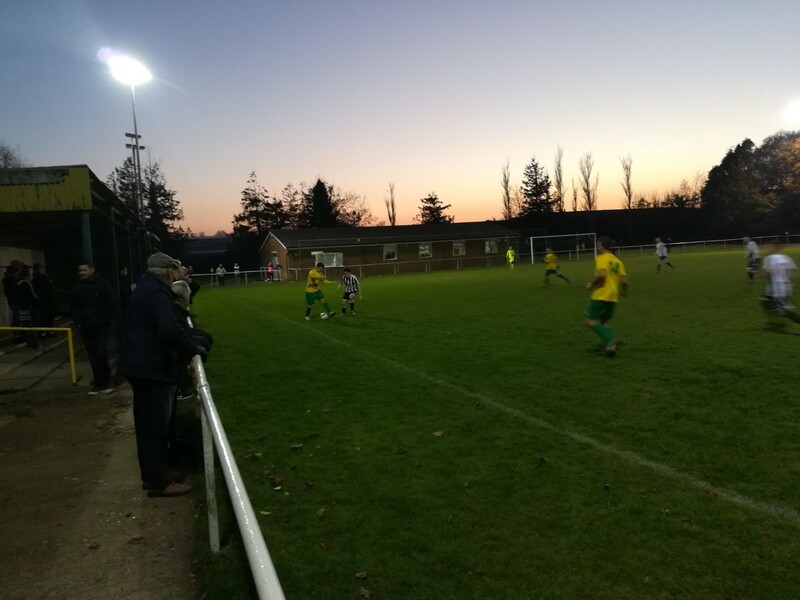 I’d been to Hailsham’s Beaconsfield ground a few times previously. 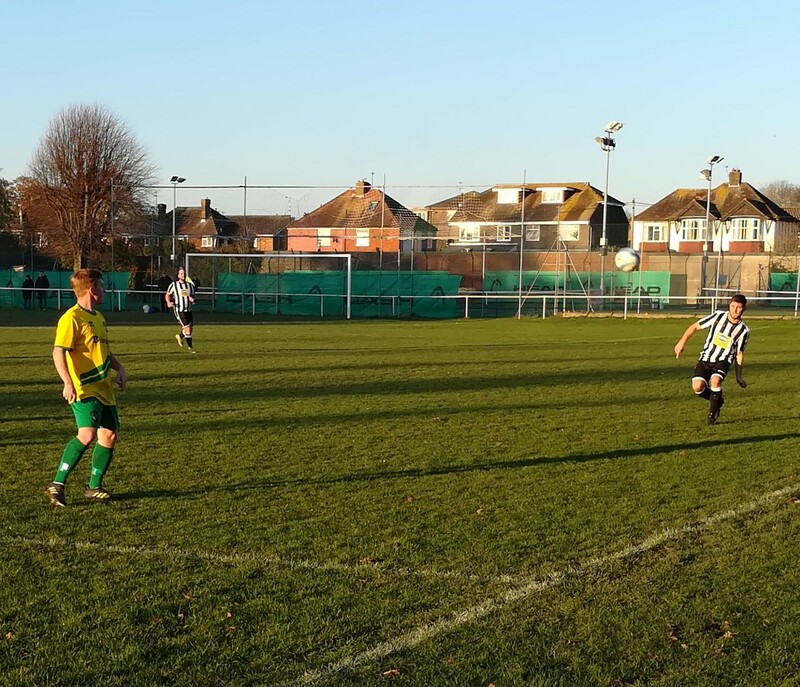 Most recently about ten years ago when I actually played there rather than spectated – it was used as a Cup Final venue by the Lewes Sunday League. I can’t recall the result of that match (which can be translated as we lost). Having paid £5 to get in (nothing for the children) and 50p for a program (a bargain), I could instantly see that the ground had changed little since my last visit. 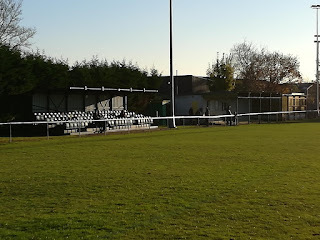 It’s a typical county league standard ground, with a small seated stand down one side of the pitch, and then a larger covered terraced area a little further down. Under this cover are a couple of kiosks; one selling hot drinks and snacks, the other hot food. There’s also a decent clubhouse, with a bar offering a good range of drinks, and a pool table which my children thought I was very cruel for not letting them play on. Seriously, if I had of done, they’d probably still be playing now! In fairness, 20 minutes into the match there was little sign of the hammering that was to follow. The opening exchanges of the game had been fairly even and uneventful. There’d been little in the way of goal opportunities and I’d probably go so far as to say that St Francis Rangers had actually edged the opening exchanges. This all changed, though, when Connor Townsend finished off a quick counter attack after 23 minutes to give the hosts the lead. 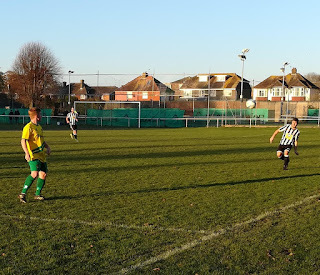 While Hailsham hardly piled on the pressure at this point, you could instantly sense that the confidence levels of the Rangers’ players dropped slightly, and The Stingers began to create more in the way of clear-cut scoring chances. Perhaps had the visitors managed to get to the interval just the one goal behind then things may have panned out differently. But they couldn’t. 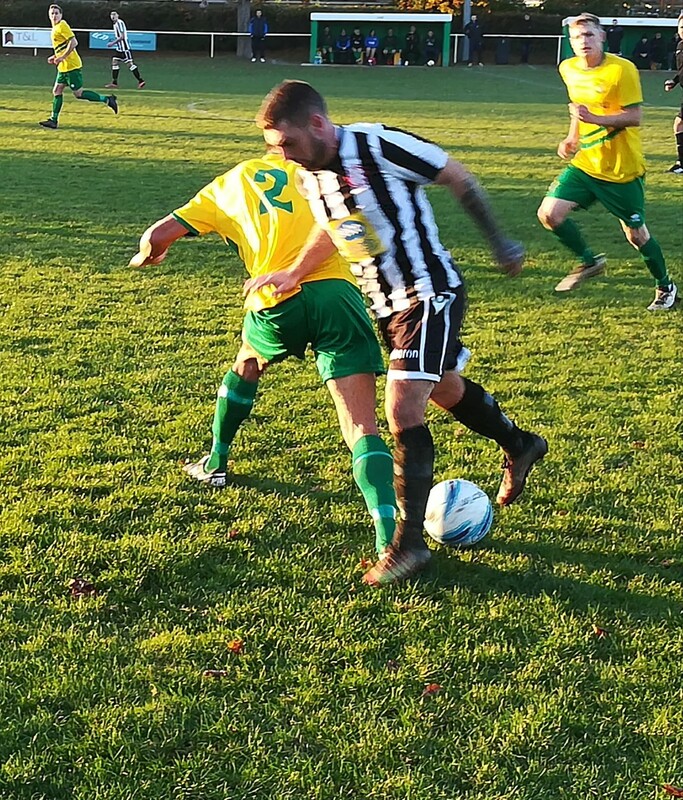 Five minutes before the break, Liam Baitup finished off a fine flowing Hailsham move, and even though it was only 2-0, one couldn’t help but sense that the game was over. Rangers were certainly working hard enough, but didn’t ever really look like they had two goals in them. 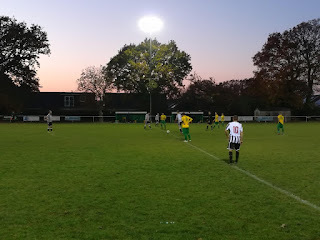 The game was put to bed within the first 15 minutes of the second half. 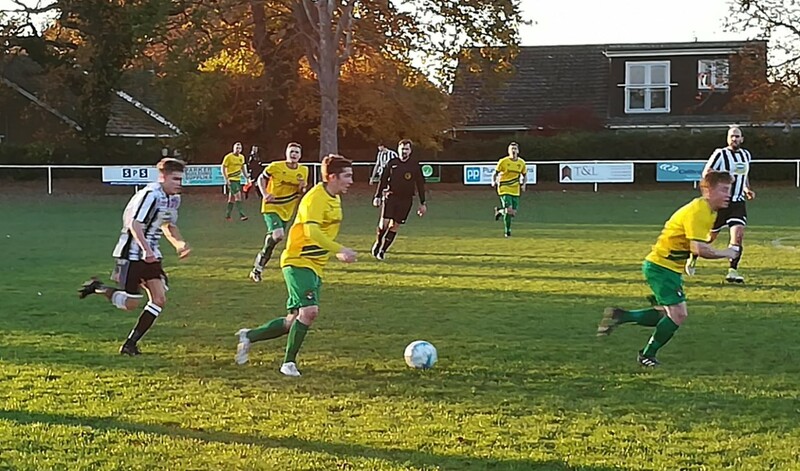 First Scott Taylor made it 3-0 after the Rangers defence failed to clear its lines from a corner, then Baitup added his second and Hailsham’s fourth with an exquisite free-kick (see video). Now, I don’t want to go on a rant about a referee for the second time in a week, and while today’s official certainly wasn’t as bad as the one I’d witnessed at Newhaven’s Fort Road Ground on Tuesday night, he at this point started to lose control of what had hitherto been a fairly needle-free game. The catalyst seemed to be when he appeared to let St Francis’s James McKenzie off with what should have been a second-yellow card. McKenzie was then instantly substituted, yet the ref seemed to atone for this decision by awarding every 50/50 decision against the visiting team (he had probably slightly sided with them up to this point). This was to have disastrous, and rather bizarre, consequences late in the game. 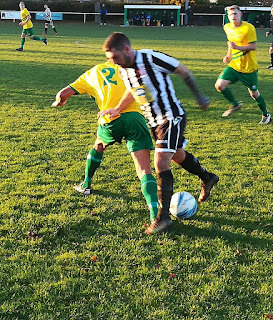 When Hailsham’s fifth goal arrived on the 70-minute mark, once again Taylor was the scorer, you would have forgiven St Francis for just sticking men behind the ball in a damage limitation exercise. This isn’t what they did, though. Instead, they lost all shape and tactical discipline, and just poured men forward for a reason I couldn’t – and still can’t – really fathom. The game was over. Surely their only mandate should have been to avoid getting a real hiding? In fairness, during this period, St Francis did have a couple of shouts for a penalty waved away by the man in the middle, yet they still didn’t really come close to pulling one back. With the space the visitors were leaving at the back, it seemed only a matter of time before the Stingers would add to their total, and they did so. 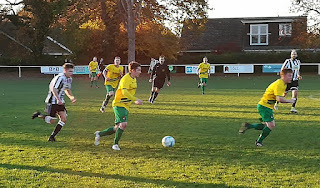 First Taylor completed his hat-trick on 85 minutes, then two minutes later, Jamie Salvidge (who had been Hailsham’s manager this time last week) got himself on the scoresheet. Then things went a little bit crazy. As the clock ticked past the 90-minute mark, Hailsham were awarded a soft-looking penalty (a couple of their earlier shouts had looked more obvious). It was a decision that swiftly led to Barry Leete being sent off for a second booking – presumably for dissent rather than for the foul itself. Baitup confidently stuck the penalty away for his hat-trick. Then, when an angry Harrison Parker booted the ball away in pure frustration before the match had even restarted, he too was shown a second yellow. St Francis were suddenly losing 8-0 and down to nine men. Their fans were incredulous. Indeed, had the ref shown some common sense and not awarded a highly dubious injury -time penalty against a team already trailing 7-0, then this whole unsavoury incident could easily have been avoided. The Stingers then rubbed salt into the visiting team’s wounds when Taylor netted his fourth deep in injury time. Brilliantly, my children had decided to go to the toilet a few minutes earlier and missed the two red cards and the last two goals. My eldest had suspected something had happened, though. “Their number five just walked past me saying the ‘f’ word a few times. He’s not very happy. What happened?” he asked. I actually ended up having to get another member of the crowd to verify what he had missed during his quick trip to the toilet. He couldn’t believe it. So, I can now firmly add a real tonking to the list of things I’ve seen this season. This is actually the biggest winning margin I’ve ever seen at a live game (not including Sunday morning football) and equals the most goals I’ve seen in a single match (again, not including Sunday mornings). So, here’s to a 5-5 thriller next weekend. Well, it worked this week, after all!